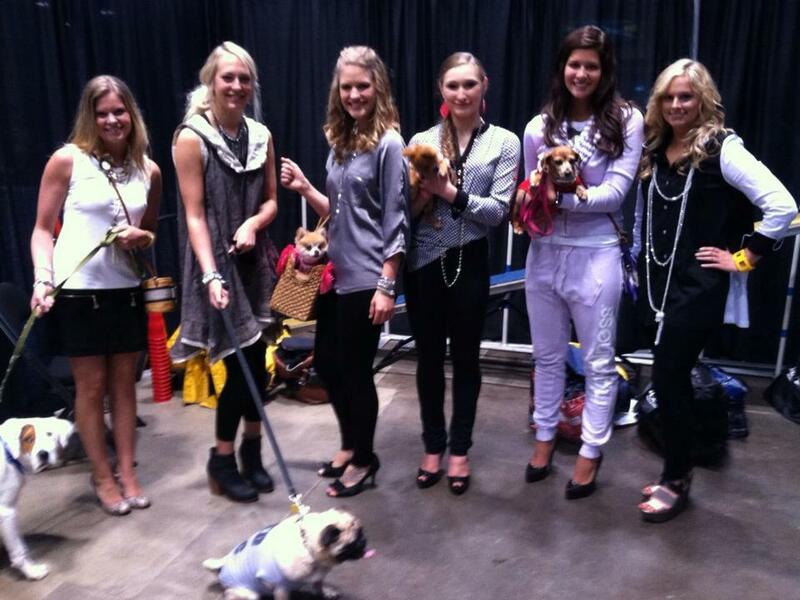 Last weekend, Cincy Chic put together two fun fashion shows for the Petopolis expo. 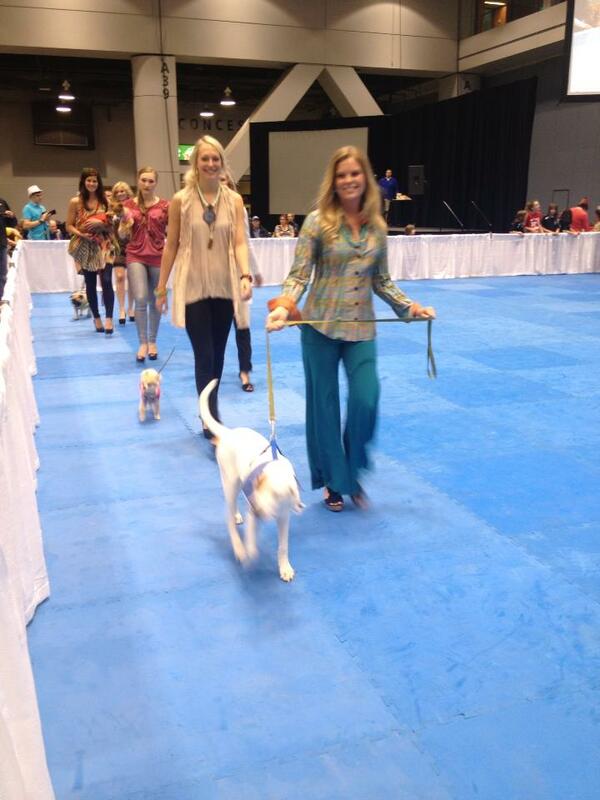 The human models wore new Spring styles from Three French Hens and our fab four-legged friends featured in the show were outfitted by Pet Passions and Fashions! I loved working with Pet Passions and Fashions because no matter what animal we were working with, I found something they looked absolutely adorable in! On Saturday’s show, Cincy Chic readers’ pets were nominated and selected to get in the show, so we had some super cute little pups that day. Then, on Sunday, we used cats and dogs from the SPCA. So, not only was it nice that Pet Passions and Fashions had accessories for all shapes and sizes of pets, but it was important that we had outfits that didn’t make the animals uncomfortable or upset. We found great collars, bandanas, leashes and other accessories that both the animals and parents loved! Thanks to Pet Passions and Fashions, Three French Hens, MTM Cincinnati (who provided models) and all my interns who helped make our Petopolis fashion shows a big success! Our next pet fashion show is THIS Saturday at WagsPark! Click here to learn more about it! Hope you can make it! Right before Valentine’s Day, we had a fun “Primp, Pamper, Prep” event at Cincy Style Bar, and I just got back the pics from it (they’re all posted here). The event gave everyone a tour through the new salon and blowout bar, offered tips/tricks for hair/makeup, shopping, lots of giveaways, and a fashion show at the end of the night featuring clothes and accessories by Three French Hens, and hair/makeup by Cincy Style Bar. One of my favorite parts of the night was transforming this gal from drab to fab in about 10 minutes. They randomly picked her name out of a hat for an instant glam up to show how you can just pop in to the Cincy Style Bar to get your hair and makeup done in a flash. She came in with little makeup on and her hair pulled back…. and she ended up looking like she was ready for a red-hot date (“after” pic below)! So impressive! Click here to see all the pics from the event and fashion show! The pics of the fashion show are up on our site, and there are more pics up on our photographer’s Facebook page. The Canine Couture was all hand-made by Pet Passions and Fashions. And our human models had hair/makeup by Mitchell’s Salon & Day Spa, and clothes/jewelry by Three French Hens. 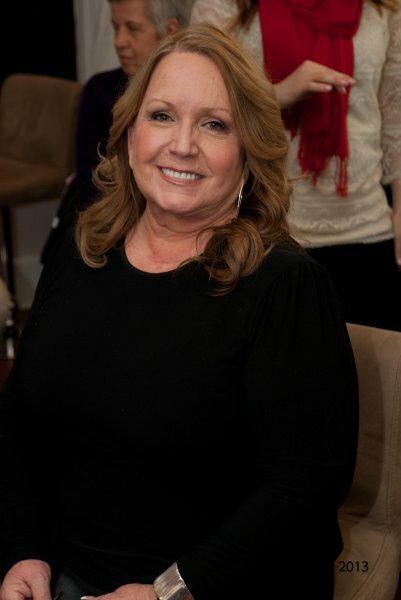 I was talking backstage of the fashion show with Three French Hens’ owner, Alison. 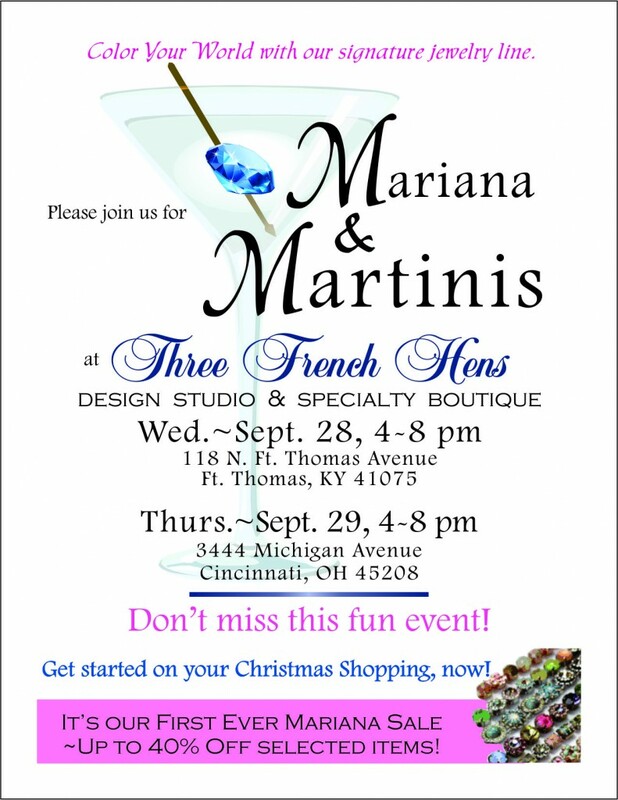 She told me that some of the jewelry featured in the show would be on sale at this “Mariana and Martinis” event she will be hosting at her two locations. She said Mariana is her best-selling line, and the stuff never goes on sale. So the trunk show will be a big deal because some items will be up to 40% off! Click here and see below to learn more about the event! My husband is a musician. And I run Cincy Chic. So, naturally, “rocker chic” is a look I like to go for when I go to his gigs. It’s actually a tough balance to strike. Lets just suffice it to say you don’t want to look like Audrey Hepburn when you walk into a biker bar. But I discovered one place in town that has great rocker chic wear – Three French Hens in Hyde Park. I heard they also have a store in Ft. Thomas, but I’m not sure – I’ve never been to that one. Their shop in Hyde Park is suuuuper cute. It’s right by Poeme on Michigan Ave.
Not all their stuff is rocker chic, but they do have a few hidden gems that are great groupie gear. They also have items perfect for blinging up a boring outfit. So, when I heard they just got back from market and have a ton of new arrivals, I couldn’t wait to check those out. Below are pics of all the new stuff they got in. I’m in love! Lots of bling, glitz, and rocker chic couture! I can see myself at his next gig in the gray cotton dress with the cross necklaces and leather band bracelets!